Consumers and service providers are becoming more and more inclined to doing business electronically, an aspect that has thrusted many Montreal web development professionals to the limelight. It is without a doubt that, staying updated on current as well as emerging e-commerce trends will give you a competitive edge in your industry! Here is what you should know, and put to use accordingly, to suit your business goals. Mobile phones are here to stay and they just keep getting smarter! With the ability to browse the internet and access a world wide web of information, mobile phones give their users navigating prowess and the advantage of getting data at their fingertips. Aligning your business transactions to be mobile friendly is key. Online shopping that is hassle-free should guarantee accessibility from virtually anywhere and offer seamless flexibility, whenever, for consumers. These are reasons that are proving mobile friendliness to be a major driving force for any business looking to grow. Enlisting experienced Montreal web design service providers would be a smart business move! Some promise FREE. Others deliver FASTER! Shipping and handling shouldn't be a nightmarish experience on both ends of the business chain. While free shipping and faster delivery does not always guarantee better handling of your wares, it may sound attractive in terms of building and turning a loyal following to lifelong customer base. When your resources limit your shipping scope, thinking outside the box and offering your customers unconventional shipping and handling perks may just do the trick. Why not give shipping a unique, personable experience that doesn't have to blow your budget out of proportion and can still make your customers feel valuable! Ask anyone who has been bombarded by irrelevant "pop-ups" while browsing and they will almost not have anything nice to say about that! 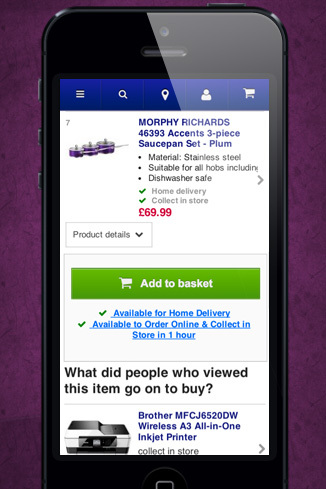 Relevancy of browsing options and streamlined recommendations can make or break a potential purchase. As the technology 'geeks' often refer to it as 'guided discovery' (which is just a term referring to 'relevant browsing options'), it should be optimized in a way that offers the consumer twice, if not more, the information in half the browsing time. Get in. Find what you want. Get out! Browsing time is money, no one wants to get stuck surfing the web in circles! Now, you have managed to get ahead of your competition with providing an excellent mobile experience and personalized shipping perks. Do not ruin it all with a painful checkout experience! Simplified and frictionless payment options that offer flexibility and security are important. Invest in them! Your brand is your best weapon for e-commerce success. Align your brand with your vision, mission and goals. Find multiple outlets and platforms to not only convey your message but also to reach your target consumers. Think global and act local! Adeo Internet Marketing professionals are best suited to work with you to achieve brand superiority! Enlist today.